An important contributor to the efficiency in Photosystem II is mediation of charge separation by a tyrosine residue (Tyrz). Oxidation of Tyrz as part of the charge separation process occurs in concert with transfer of a proton from the oxidized tyrosine to a neighboring histidine (His) residue. Photosystem II is the first protein complex in the light-dependent reactions of oxygenic photosynthesis. It captures photons and via charge-separation uses the energy to oxidize water. The TyrZ-His redox-relay pair couples proton transfer to the redox process between P680 and the water oxidizing catalyst in photosystem II. 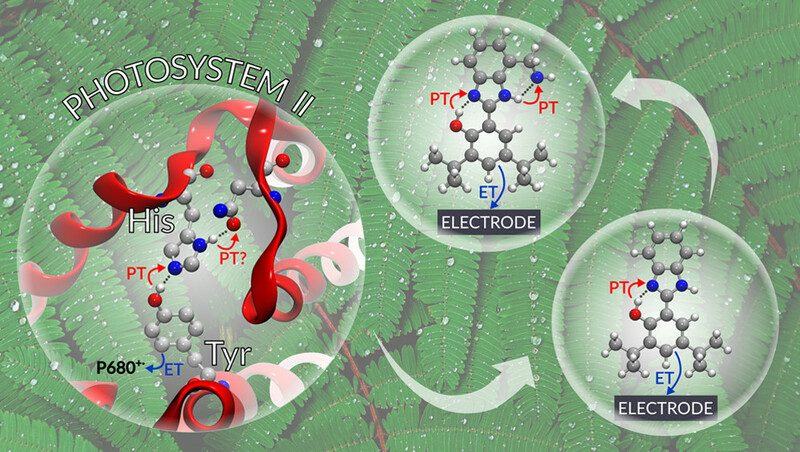 In a recent collaborative study with researchers from the University of Illinois, Université Paris-Sud and the University of Virginia, Tom Moore, Ana Moore and Devens Gust of Arizona State University's School of Molecular Sciences recently showed how theory can be used to guide the design of a concerted electron–proton transfer process, inspired by the a TyrZ-His pair in Photosystem II. The study used artificial redox relays based on phenol/benzimidazole pairs to test the theory that a concerted two proton transfer process associated with the electrochemical oxidation of the phenol would take place when the benzimidazole substituents are strong proton acceptors, such as primary or tertiary amines. Theory also predicts a decrease in the redox potential of the phenol and a small kinetic isotope effect (KIE). Electrochemical, spectroelectrochemical and KIE experimental data provide strong evidence to support these predictions. The work was described in a recent paper in ACS Central Science. This study is significant because it shows that theory can be used to guide the design of artificial systems for energy conversion. Protons are important in myriad ways for solar fuel production, so the results of this study also have implications for managing proton activity to optimize efficiency at energy conversion sites involving water oxidation and reduction. This work was supported by a DOE grant to Gust, Moore and Moore and also involved SMS researchers S. Jimena Mora, Matias Villalba, Marley E. Tejeda-Ferrari, Paul A. Liddell and Brian R. Cherry.